Rabbi Arthur Waskow’s expansion of and meditation on the Shema was originally composed on the 6th of Tishrei, 5764 (October 2nd, 2003). 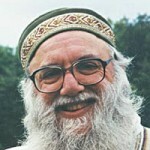 “שמע | Sh’ma: an Interpretation for the 21st Century by Rabbi Arthur Waskow (2003)” is shared by Arthur Waskow with a Creative Commons Attribution-ShareAlike 4.0 International copyleft license. 2011-08-12 – 12 Av 5771 at 10:04 pm · Reply. Thank you! This very close to what I long believed Shema to be spoken. During my Adult Bar Mitzvah, I considered/named myself and fellow Jews: Wandering Wrestlers of Presence.